Seven MILLION acres of breathtaking autumn brilliance in Michigan’s Upper Peninsula! We are right around the corner from fall and the brilliance of color that stretches across Michigan. Nothing is quite as majestic as the Upper Peninsula in fall. The colors, the water, the bridges, the water falls . . . one could go on and on. There are 10 specific tours laid out for the leaf peepers that are worth your time. FRESHWATER VACATION RENTALS has over 30 cabins and cottages in the UP, where you can stay for your weekend – or week – away in fall. 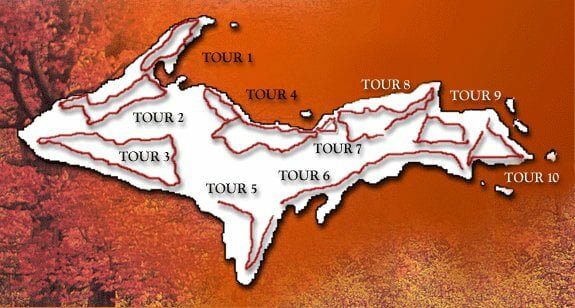 Quilt Tours in Michigan’s Lower Peninsula! TOUR DA YOOP, EH — FALL + APPLES = YUMMMMMM!